By default on the timetotrade charts, the MACD Leading Moving Average Period is 12, the Trailing Moving Average Period is 26 and the Smoothing Factor used to calculate the Smoothed MACD signal line is 9. There are many variation on the MACD settings with 10,35,5 also being popular. 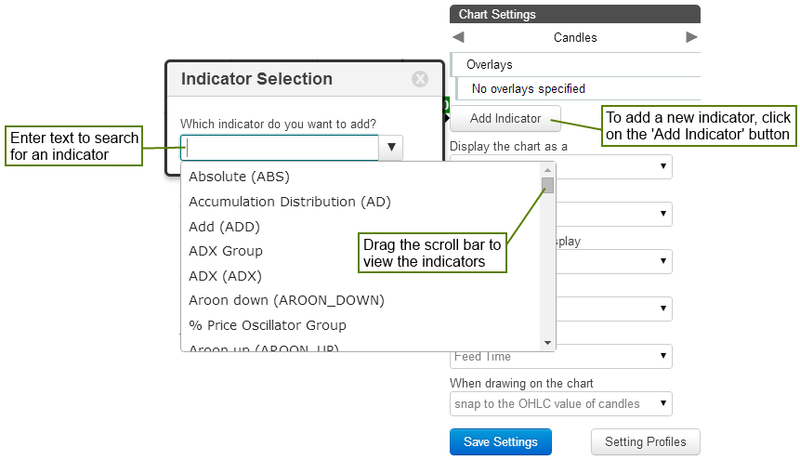 Adjust the default time and interval parameter values to find the best fit between price movement and the MACD indicators. There are several ways in which the MACD is interpreted and it should be noted that it is best used to trade in a trending market. During periods of range bound sideways trading, signals can be unreliable as illustrated above. Firstly, note that the MACD generally rises and falls with price movement (with a lag as calculations are based on moving averages). 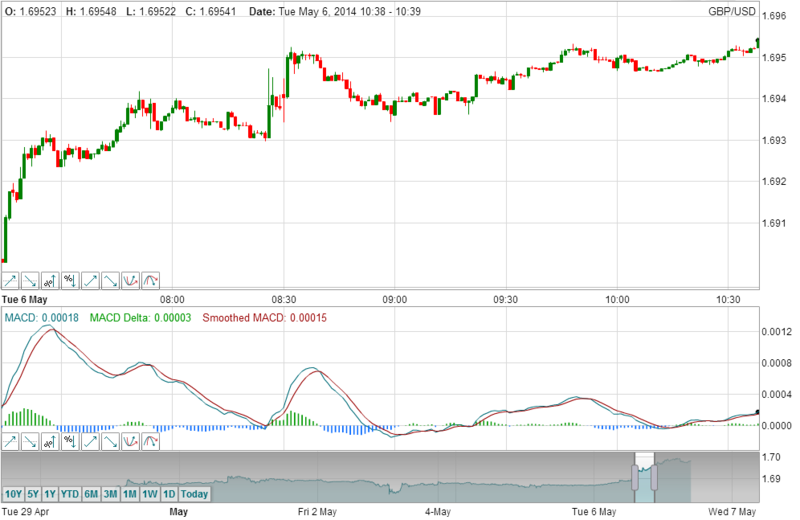 MACD rising in value is generally considered bullish, whereas MACD falling in value is considered bearish. When the MACD rises dramatically over a short period of time and reaches extreme values, it can imply that the market is overbought and to expect a price reversal. And vice-versa, should the MACD fall dramatically over a short period of time and reach a negative extreme, it can imply the market is oversold. The indicator itself fluctuates above and below zero, the ‘centre line’. When MACD is equal to zero, the long and short period exponential moving averages upon which the MACD is calculated, are equal. When MACD is above zero the shorter term average is higher than the longer term average (implying positive momentum and bullish trading sentiment). When MACD is negative, the fast exponential moving average is lower than the longer term exponential moving average, implying negative momentum and bearish trading sentiment. The MACD crossing above and below zero can indicate a change in trend. Rather than waiting for the MACD to cross zero, an earlier indication of a change in trend is provided when the MACD crosses its signal line. When MACD is below zero and crosses above the signal line, it is considered a bullish buy signal. When MACD is above zero and crosses below the signal line, it is considered a bearish sell sign. Another method used is to look for divergences. This is where the price makes new lows (or appears to be bottoming out) but the indicator fails to make new lows, or vice versa if the market is making new highs. For example, where price makes a new high but the MACD fails to do similar, this indicates that the trend is starting to run out of momentum and recent price increases are not sustainable, signalling a sell opportunity. On the other hand, where market’s price makes new lows but the MACD fails to do similar, this implies increasing momentum and that the down trend may be coming to an end. The MACD is the difference between 2 Exponential Moving Averages (EMA) typically based on 12 for the Leading EMA and 26 periods for the Trailing EMA. The Smoothed MACD signal line is Exponential Moving Average of the MACD and its default is 9 periods. 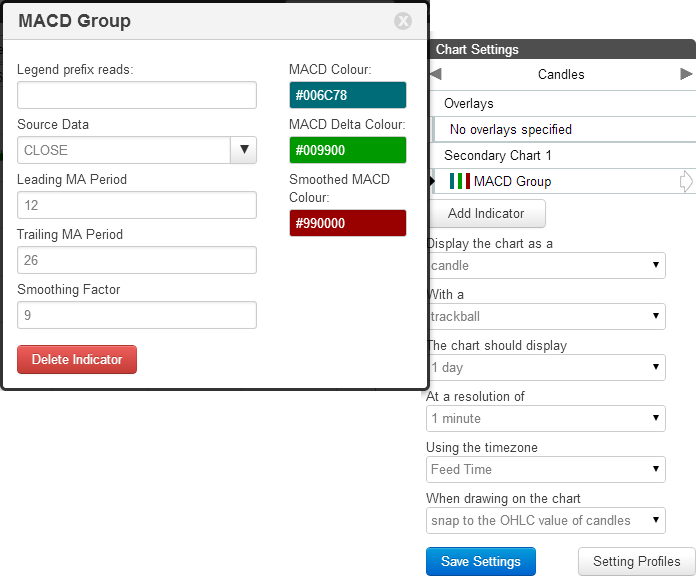 After adding the MACD indicator, within the chart settings, click on it to set the parameters and change colours.